A simple method to sense DNA, as well as potential biomarker proteins of cancer or other diseases such as Alzheimer’s, may soon be within reach – thanks to the work of a team of Yokohama National University researchers in Japan. 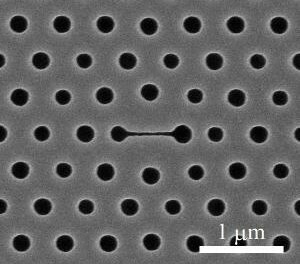 As the team reports in Applied Physics Letters, from AIP Publishing, they created a photonic crystal nanolaser biosensor capable of detecting the adsorption of biomolecules based on the laser’s wavelength shift. When the team first set out to explore photonic crystal nanolaser sensors, they weren’t focusing on the intensity of the laser emission because it’s sensitive to the quality of the fabricated laser and, frankly, they didn’t expect it to show sensing signals. So far, the team’s work is the first report of the detection of surface charges using such photonic sensors. “It enables detection of the adsorption of biomolecules from the nanolaser biosensor both in terms of wavelength and intensity,” Baba said. Since it involves different physical parameters, the researchers can examine the details of the biomolecules. It also “enables detection of the adsorption by measuring only its intensity, which is a significant advantage compared to conventional methods,” Baba added. One conventional biosensing method “relies on fluorescent labels that are functionalized to biomolecules in advance,” he elaborated. “We can easily see the target biomolecules by using photoexcitation, which is the de facto standard method used today in bioscience and medical diagnoses.” The downside? The functionalization process of the fluorescent labels is expensive. For this reason, many research groups have developed label-free methods such as those using resonance in optical cavities and plasmonic states. However, these require spectral analyses using spectroscopy of wavelength or resonance optical angle – also expensive. By contrast, the team’s nanolaser biosensor needs neither labels nor spectrometers if they use the intensity change. This greatly simplifies detection, which they’ve already demonstrated in the case of DNA.